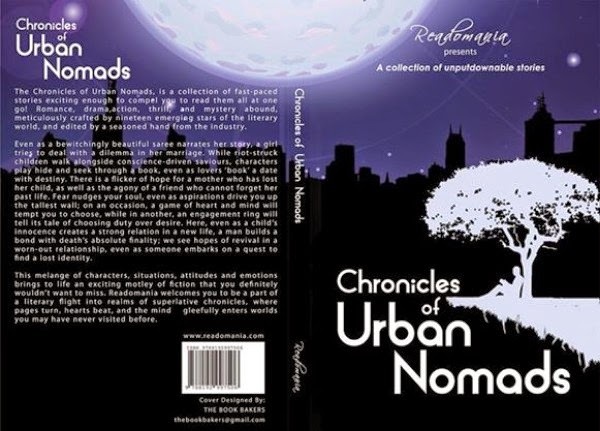 Blurb: The Chronicles of Urban Nomads, is a collection of fast-paced stories, exciting enough to compel you to read them all at one go! Romance, drama, action, thrill, and mystery abound, meticulously crafted by twenty emerging stars of the literary world, and edited by a seasoned hand from the industry. The name is such intriguing that one can’t stop himself from reading the story at one go. Ayan Pal has narrated the feelings of a bewitchingly beautiful Benarasi Sari in delightful words. The way the whole story is portrayed through the eye of a Benarasi Sari, is just wonderful. Being a Bengali, I can very well understand the perspective of writing this story and can easily say that this story will entertain all types of readers. The second story in the category of Imagine does complete justice to its genre. Being one of the shortest story of the book this story conveys the feeling of two friends and the happiness surrounding Blue Slippers. My favorite part was the end which will definitely give the readers goose bumps. The most interesting thing about this story is the protagonist who is narrating the story. The readers will definitely become bewildered just like me after finding the narrator of the story. The pain was described in exact words and the name also seems perfect for a story like this. After reading the third story, I understand why the category is named Imagine. The word Soul Mate denotes a lot of connotations. The author have very efficiently hid the identity of the soul mate of Kumar (the main protagonist) till the end and when it discloses, the readers will appreciate the skill of the author. The story is executed in a different way which I am sure will hook the readers. the reader’s eyes. My personal favorite in this genre. This story is about the most famous battle that we all witnessed at some past of our life, between our own heart and mind. This story revolves around KK, a boxing champion who have to choose between his heart and his mind inside in the boxing ring. The story has a wonderful message for the readers at the end but comparing to the previous stories, this could have been written in a better way. To know why KK had to made the choice inside the ring, one must read the story. This story follows the previous stream and here the story teller is an engagement ring. This story is simple and have been written wonderfully. The story has a very strong story line but the author was somehow carried away with the flow of the story and at places the ring lacked the limelight. Overall a nice story with a nice ending. The beauty of this story is the wonderfully chosen words and the way of describing the scenes. The readers are going to love the way the author portrays the whole story through the eyes of an inner self. The rich content and the flawless narrating style makes this story one of the best of its series. The story has an essence of its own and will make the readers cherish the flavor. The different content perfectly suits the different name. I appreciate the author for creating such a unique character and his ability to keep readers hooked from the very beginning with his narrating style. I can easily say the readers are going to love the ending which brings the harshest truth of the story. The name of the story sounds familiar and common but the content isn’t the same. The story is short and compelling. The narrating style is so strong that within these four pages the readers will break into tears. This is how a short story should be written, short, distracting and intriguing. A nice name for a story like this. The narrating style is simple and will help the readers to visualize it in a better way. I believe this story will become more gorgeous if the start was a bit different or improvised. The end makes up for the flaws and will keep the readers thinking even after completing the story. This is the story of Kashish and Rohan and how an unborn child removes the invisible wall between them. The start of the story is very good and the fluent narrating style will force the readers to complete the story in one go. The author has a wonderful skill of describing the feeling of the protagonists which will definitely reach the hearts. This story is the best one can get from the second section. When a reader buys an anthology, I am sure, they always search for a story like this which have a flawless and simple language, interesting and motivating storyline and which will leave a lasting effect on them. Kudos to the author for framing such a delightful story. This story is from the author who wrote the most interesting author bio. It tells us about a second chance, about keeping hope alive, about keeping promises and that is why I say the name is perfect. I felt the frequent jumping from scenes disturbs the flow of the story and the end could have been framed in a different way which would have attracted the readers more. Again a very compelling story with a strong narrative. The feeling of a mother who has lost her child has been portrayed wonderfully. Without dragging scenes the author has very efficiently described the affection a mother holds for her son. The truth at the end brought tears in my eyes. The author has chosen quite an uncommon name for her story and it suits the content perfectly. The narrating style is the main and the only beauty of the story and the delightful describing power of the author makes up for the simple content. Comparing to the earlier stories I found this story a bit weak of the series. A different story from a talented individual. After completing the story, the first thought which crosses my mind is that this author knows how to play with words. The way he has framed the whole story and the way he draws the end will leave the readers gasping for more. The narrating style supports the storyline perfectly and keeps the whole story effortless. Here the name of the main protagonist is Mandira and the whole story revolves around her. The powerfully described scenes will make the readers think of the phase the protagonist was going through. I would have liked the story more if the author had drawn the end in a distinctive manner. The end was not that good as the intriguing beginning. This is possibly the best way to end a book like this. I loved the way the author has focused on the details and has dragged out the beauty by placing perfect words at exact scenes. The story line might have been a bit simple but the story telling skill of the author makes up for that. Again a beautiful ending of an unfussy story. This book is undoubtedly one of the best anthology released this year. Each and every story has focused on different aspects of life and will make the readers think, though I loved the Imagine part more than the Musing part. My two favorite stories in Section I is The Masterpiece by Rounak Nayak and A Little Nugget of Fear by Deepti Menon; my two favorite stories in Section II is The Last Letter by Dipankar Mukherjee and Bachelor and Baby by Jagadish Nadanalli. Thank you so much for giving us such a wonderful review about the book, letting us know how you felt when you read all the stories. Really encourages us to write more. And a special thanks for giving an unbiased review about my story in the book. I'll take it positively and keep it in mind when I write my next story. Thanks once again. I can see how much effort went into it. Thank you so much for this outstanding review on our stories! You can't imagine what joy it gives a writer to hear her story praised! God bless!